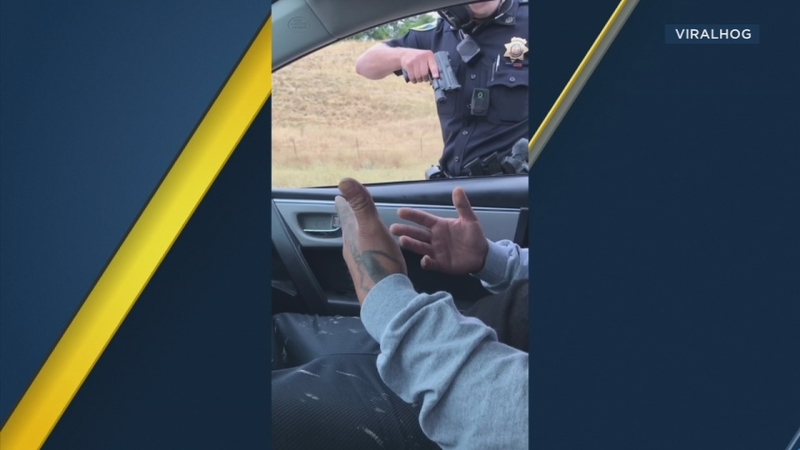 CAMPBELL, Calif. -- A Northern California officer was caught on camera pointing his gun at a passenger during a car stop for more than nine minutes, which has caused an uproar on social media. The stop happened on July 28 on the 101 Freeway between San Jose and Morgan Hill. The police department said the officer had pulled over a woman for speeding. The officer asked the woman for her registration and proof of insurance. While the woman was grabbing the documents, authorities said the passenger reached under his seat. In the video, which was captured on a cellphone, the officer began pointing his gun at the passenger, who then held up his hands. The passenger told the officer he was helping the woman look for the documents and said there were papers on the floor. The passenger then asked the officer why he was pointing the gun at him. The female driver also asked why it was necessary for the officer to continue pointing the firearm at her passenger. At one point, the passenger said he would get out of the vehicle if it meant the officer would stop pointing his weapon. The police department defends the officer's decision to point the gun at the passenger.